The leading SUV maker of India has launched the updated version of Mahindra Thar and it is now ready for sale. The company has upgraded it and is now more rigid and powerful. Apart from these, there are a lot of new and advanced features added to the vehicle, which makes it more beautiful and standard. 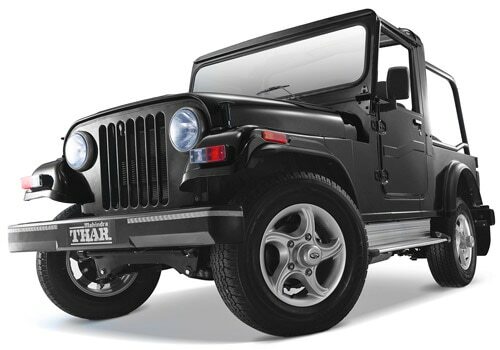 The Mahindra Thar price is quite reasonable and it is available at Rs. 4.75 lakh to Rs. 7.22 lakh (Ex-showroom, New Delhi). This sports utility vehicle is perfect for the all types of roads and especially it is the SUV for the adventure loving people. The Mahindra cars have equipped this 2.5-litre diesel engine with the displacement of 2523cc. The engine is capable to generate a power of103.6bhp at 3800 rpm and at the same time the peak torque of 247Nm at 1800-2000 rpm. It can deliver a very healthy fuel-economy on every road conditions. This compact and stylish sports utility vehicle can return15.03 kmpl on the city roads and at the same time 16.55 kmpl on highways when the four wheeler is driven under the standard conditions. The acceleration and pick up is quite good with its top speed and the SUV is capable to cross the speed of 100 kmph from the nil in only 19.5 seconds, which is quite impressive. The Mahindra Thar features are very innovative and it is loaded with a lot of good and special features. It is a perfect off-road vehicle with a lot of capabilities. The company has given this a water resistance seat with an ample of room inside the cabin, which helps the driver to drive comfortably in any bad weather conditions. It has almost all such features which make it perfect of its class. Apart from these, there are a lot of safety features too in the vehicle, which makes the SUV protected and also save the passengers from the deep injuries. The list of safety features include halogen head lamps for better lighting, side and front impact beams and many other such things, which can easily protect the passengers from any accidents. The Mahindra Thar pictures are very effective and they can easily attract the buyers. The look of the SUV is very aggressive and masculine. It is loaded with a wide radiator grille, manually adjustable exterior rear view mirror, removable convertible top, side stepper and many other such things, which makes it wonderful. It is also available in numerous exterior paint options and in all these colors, it looks marvelous.